Now in its 44th season on television, Saturday Night Live is widely regarded as an American institution. Since the election season several years ago, Donald Trump — for better or worse — has been one of the show’s biggest targets, and his son Donald Trump Jr. has also been the focus of many sketches now, thanks to Mikey Day’s impression of him (though, to be fair, Don Jr. comes out looking much better in these sketches than Alex Moffat’s take on Eric). 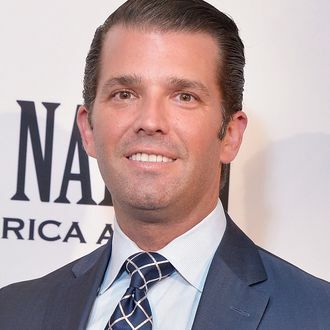 Don Jr. also grew up in New York City where the show is taped every week. This is all to say that it seems more than reasonable to conclude that Don Jr. knows what Saturday Night Live is. Setting aside the fact that Don Jr. took his comedy sins a step further by saying “skit” instead of “sketch,” there’s another reason why this gaffe is extra rich. In early 2018, comedian and writer Daniel Kibblesmith noticed that Don Jr. is a bit too fond of referencing the classic “More Cowbell” sketch from SNL on Twitter, so he decided to compile the tweets into one handy place. For a die-hard “Cowbell” fan, there’s just no excuse to not know the name of the damn show. CASE CLOSED!